Pullen in Colorado Ballet's production of La Sylphide. Photo Courtesy Colorado Ballet. Upon high school graduation, dancers are often forced to choose between going to college or pursuing a career right away. Since a dancer's professional life is short, many who put school on hold plan to eventually go back. But with more options than ever before—from online degree programs to night classes to college programs developed solely for dancers—it is becoming much easier to pursue a degree while performing professionally. Rather than wait until retirement, many dancers are getting a head start on their education now. Three dedicated professionals explain what they've gained by going back to school, and how they've made it happen. Mori in Balanchine's "Serenade." Photo by Kelly Pratt Photography, Courtesy Saint Louis Ballet. Four years into her ballet career, Saint Louis Ballet company member Tiffany Mori began her college career with a community college online course. “My dad was a professor, so college was always a thing in my mind even though I thought I would never go," says Mori. From that first class, Mori began to chip away at her general education requirements until she reached her community college limit. She was fascinated by chemistry, so her science professor suggested she transfer to University of Missouri—St. Louis, which offers a unique night program for science majors. (“Organic chemistry labs take five hours," explains Mori.) The program allowed her to do two incongruous things: dance during the day and go to the lab at night, sometimes from 6–11 pm. Time management was key to balancing both worlds. Getting up early and going to a coffee shop before rehearsals helped her knock out homework. She'd also study during rehearsal breaks and during downtime in the lab. “I really liked going into class, being able to meet the professor and have colleagues at school, to learn their stories and lives," says Mori. But having to be physically present in classes required that she speak to her professors in advance about her theater-week schedules and go to office hours to put in extra time for classes she missed. Although her schedule was grueling, Mori found the change of pace between company and campus life refreshing. “I would go into the studio in the morning very motivated and focused because of my different life at night," says Mori. Four and a half years later, she graduated with a BS in chemistry, and while she hasn't figured out her next career path, she hopes to find internships that will accommodate her rigorous schedule and perhaps enroll in graduate school as she continues to dance. A couple of years ago, Alexandra Pullen found herself caught in the web of company drama and casting disappointments. “I needed to find some balance," explains Pullen, who formerly danced with Colorado Ballet and American Ballet Theatre. She found that college courses were the perfect place to funnel her excess energy, allowing her to explore new subjects easily within the confines of her demanding schedule. She enrolled in Arizona State University's online degree program as an English major, and takes two condensed, seven-and-a-half-week courses back to back every semester. Pullen dedicates an hour or two every day to school so that she doesn't have to catch up all weekend. “Normally after rehearsal, I go to a coffee shop and work until 8 or 9 pm," she says. All of her classes are online, but ASU provides an advisor for over-the-phone check-ins and tutoring. “I still have deadlines and due dates," she says, “but it's more realistic with my schedule. I travel a lot." Overall she finds the school to be accommodating and supportive. Plus, college has helped her find a more positive mind-set in the studio. “I always thought I would dance until I couldn't stand up, but now I might explore other careers before I'm crippled," jokes Pullen. Last summer, she did an internship at Los Angeles Magazine during her layoff, and while she doesn't necessarily want to sit at a desk all day, she's happy to have opportunities to gain more communication and business skills. Rowe with Sofiane Sylve in William Forsythe's "Pas/Parts 2016." Photo by Erik Tomasson, Courtesy SFB. 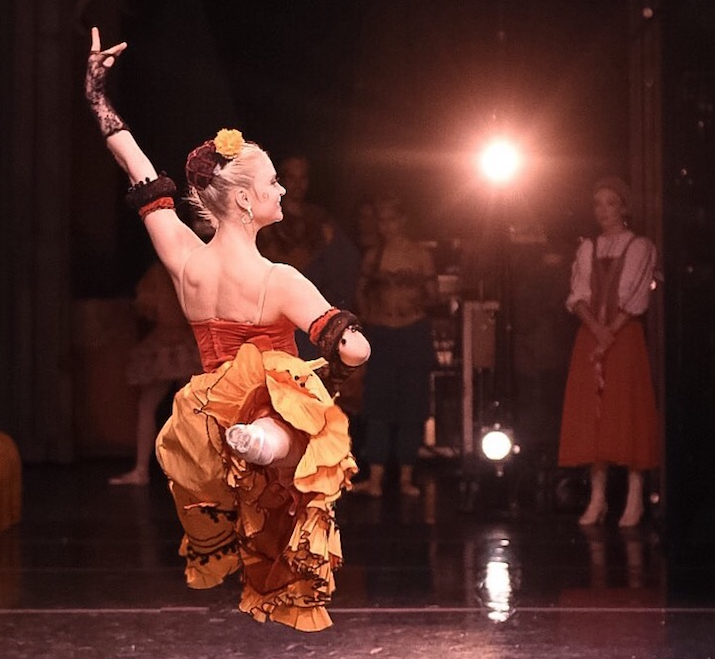 “It's important for an artist to have outside influences and understand things beyond the world of ballet," says San Francisco Ballet soloist Julia Rowe about her decision to start college. She recently applied to the LEAP program, a national BA-degree program affiliated with St. Mary's College of California, in which many of her colleagues were enrolled. The program, which offers a mix of in-person and online classes, was built around the demands of professional dancers. Students typically meet for four hours of classes on Sunday evenings in order to complete the 10 core courses offered by LEAP. Credits are also given for dance experience, life experience and outside accreditations, including Pilates certifications. Other general education and minor requirements (LEAP only offers a BA in dance) can be obtained through independent study, online courses or at a local community college or university. Though it requires a little planning, Rowe has found the degree of commitment required to be minimal when compared to a more traditional college route. Dancers can move through the program at their own pace, with some finishing in under four years and others requiring a little more time. Rowe is only a few classes in, but she's having fun daydreaming about what she may do when she retires. “I want to learn German, I love sports medicine, I love arts management," says Rowe. She's found LEAP's kinesiology course particularly fascinating, and directly applicable to her life in the studio. “I want to eventually be able to use all the years I've had in professional dance in another field."